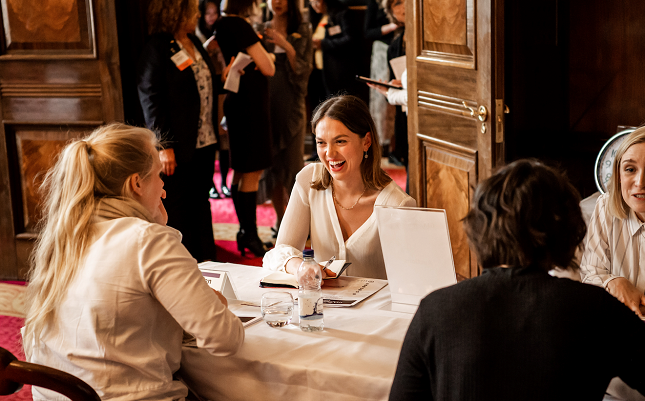 The annual GIA London Jewellery Career Fair brought together nearly 200 gem and jewellery enthusiasts from across Europe on Friday, April 5 at the historic Goldsmiths' Hall in the City of London. Job seekers had the unique opportunity to network with international and local companies looking to fill more than 60 positions in all areas of the industry. They also heard from a panel of industry professionals and could spend quality time in one-on-one career coaching. The event opened with a welcome address from GIA London School Director Mehdi Saadian and was followed by a panel discussion on "Job Success in Todayâ€™s Market," moderated by GIA President and CEO Susan Jacques. Peter Buckie, director of Gem Services; Harriet Kelsall, founder and chair of Harriet Kelsall Bespoke Jewellery; Faris Saif, associate at Sothebyâ€™s; and Henry Deakin, director of sales at Deakin & Francis all shared insights gleaned from their extensive experience. Speaking on the value of learning, Buckie began the discussion saying, "Iâ€™ve been in [the industry] for 55 years and Iâ€™m still learningâ€¦knowledge to me is power, and it starts right here now!" Kelsall shared advice for starting and growing your own business: "What you need is a bigger idea, a way of combining what you love and do with something a bit freshâ€¦or just putting two concepts together that havenâ€™t been put together." Saif spoke about the impact that GIA had on his career, adding, "GIA is a fantastic family more than anything elseâ€¦one of the key things on my journey was the people I met at GIA and also in passing through the various [events] like todayâ€™s Career Fair." Closing out the panel, Deakin discussed the importance of passion. "You need to consider your own heritage. What are your personal values and what matters to you? Youâ€™re going to be at work for a long time so you may as well do something that you love."